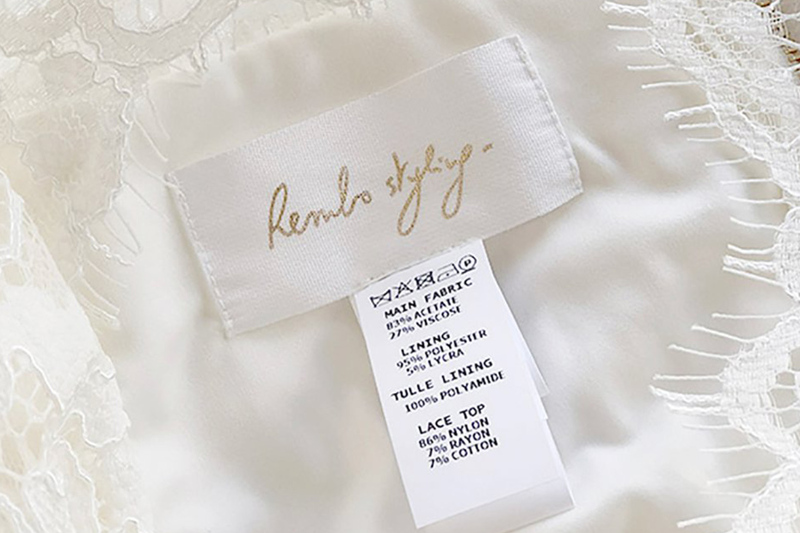 Rembo Styling | Learn how to clean your wedding dress! Learn how to clean your wedding dress! Not up for a ‘trash the dress’ photoshoot after your big day? Prefer to have a sneak view at your wedding dress once in a while, even when the day has passed? Or do you want to reuse your dress after the party? A wedding dress is too precious. It’s safe to say that cleaning a wedding dress is very specialised and requires a whole lot more attention than regular clothing. We therefore recommend you get it gently cleaned by a specialist dry cleaning company. Our dresses carry tags with their composition to ensure your dry cleaner doesn’t make a mistake. Wedding dress cleaning and preservation should only be done using virgin solvent. Virgin solvent is either new solvent or newly distilled solvent. Good wedding dress cleaning should have no noticeable odor. Make sure your dry cleaner gives you a Guarantee that they won’t damage your dress during the cleaning process. If any damage is done by your dry cleaner, you want a refund for the purchase price of your dress and the cost of the dry cleaning. The sooner you take your dress to the dry cleaner for cleaning, the better! Try not to wait until after your honeymoon. The quicker you act, the less likely the stains will remain. If you’re off on honeymoon immediately after the wedding, perhaps you can ask your maid of honor to take care of it! Don’t try to save money on dry cleaning by settling for a cheaper service; a wedding dress is too precious. We seriously suggest you don’t turn the cleaning of your wedding dress into a DIY project . However, if you’re tempted; never use bleach on your wedding dress! Protect your dress from sunlight. Store it in a cool dark place inside the dress cover given to you by your bridal boutique, to prevent discolouration. Check our composition label; there’s a big difference between silk or polyester treatment.